Column vol.08 - race | Yamaha Motor Co., Ltd. The famous race commonly known throughout Europe as the "TT" is, in its full name, the Isle of Man Tourist Trophy. It is not to be confused with the British GP races held at Silverstone or Donington Park in the Grand Prix series, because the TT is a completely different kind of race. The TT is run over what is known as the Mountain Course. It is 60.725 km in length with an elevation difference of 400 meters and 37 sections made up of numerous large and small turns and straights. Since it rounds the island using public roads, it is scenic but the weather is unpredictable. It might be clear and sunny on the flat areas of lowland but climbing into the mountain sections often brings the riders into dense clouds of mist. Although it was removed from the World GP series in 1976, it maintains its reputation as the oldest and one of the most difficult motorcycle races of all. That is why people refer to it with respect as the one and only "TT." When Yamaha decided to compete on the world racing scene, the first race they set as their goal was the TT, but none of Yamaha's best riders-Fumio Ito, Yoshikazu Sunako, Taneharu Noguchi or Hiroshi Hasegawa-were able to win it. Even Phil Read on the RD56 with their unbeatable strength in the 250cc class and two World championship titles in 1964 and 1965 had not been able to win the TT for some reason. Ironically, Yamaha'sfirst triumph at the TT would come not in the 250cc class where it was now so strong but in the 125cc class, where Yamaha had been winless in GP competition through its first four seasons until the TT round of 1965. There, Read rode the RA97 to Yamaha'sfirst victory at the TT and its first GP125 win at the same time. This first win would mark the start of many more wins for the Yamaha 125cc racers. 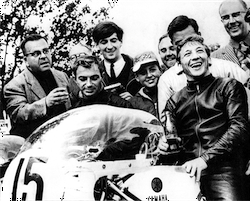 The following year, 1966, Yamaha returned to score a second consecutive win at the TT with Bill Ivy piloting the RA97. In that race, a heavy fog had delayed the start for three hours, but fresh off wins at the Spanish and Dutch GPs that season, Ivy was able to keep his focus despite the bad conditions and use his 160cm, 55kg body to the fullest in maneuvering the 125cc machine through the tricky Mountain Course. Along the way he had scraped his machine's cowling on a wall while running at a speed of 160 km/h but still managed to come home with a faster time than any of the 50 riders in the 125cc class. The average speed of 157.15 km/h that Ivy ran over the three laps of the race (172.175km) and his fastest lap time average of 158.59 km/h were both course records at the time. Ivy went on to finish that season ranked 2nd in the 125cc class, and the next year he took the championship with unmatched strength, winning eight of the 12 rounds. 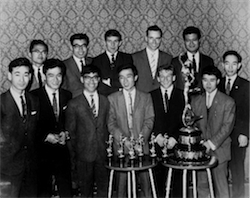 Yamaha went on to win the 125cc class Tourist Trophy at the Isle of Man four years in a row at the through 1968. Meanwhile, Yamaha's only 250cc class TT victory came in the 1968 season when both Honda and Suzuki had withdrawn from the World GP.